Plasma cell neoplasms compromise multiple myeloma as well as osseous and extrasosseous plasmocytoma and are defined by the World Health Organisation as diseases with clonal proliferation of heavy chain class-switched mature B-cells with a characteristic secretion of a monoclonal immunglubolin (M-protein) . Isolated accumulations of plasma cell outside the bone are called extramedullary plamocytoma (EMP) and are predominantly found in the upper aerodigestive tract [1, 2, 3]. Other organs may be prone to EMP spread such as skin, lymph nodes, brain, spine, thorax, liver, urogenital and gastrointestinal tract, mammary tissue or extremities [4, 5, 6, 7, 8, 9, 10, 11, 12]. Its diagnosis requires a single extramedullary mass of clonal plasma cell with normal bone marrow histology, absence of end organ damages (anemia, hypercalcaemia, renal impairment, osteolysis) and only minimal serum or urine level of monoclonal immunglobuline [1, 3]. Literature reviews show typical occurrence between the fourth and seventh decade of life with a male predominance [1, 2, 4, 13, 14]. Local symptoms in the head-and-neck region include epistaxis, facial swelling or facial pain painless mass and visual disturbances as well as sensory or motor cranial nerve impairments [15, 16]. 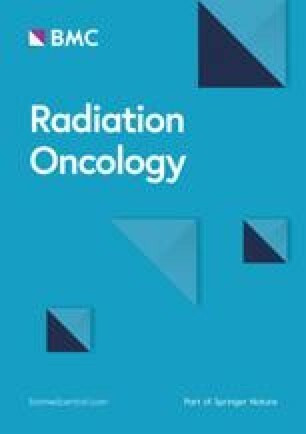 Radiotherapy (RT) is the treatment of choice for EMP with high local control rates and long-term curation [3, 17]. As in other hematologic disease, defining the adequate RT dose has taken center stage in the delicate balance between sufficient tumor control and potential toxicity. Whereas dose-deescalation is currently being investigated for lymphoma and leukemia, there is no stringent evidence to suggest low-dose regimes for plasmocytoma [18, 19, 32, 33, 34]. 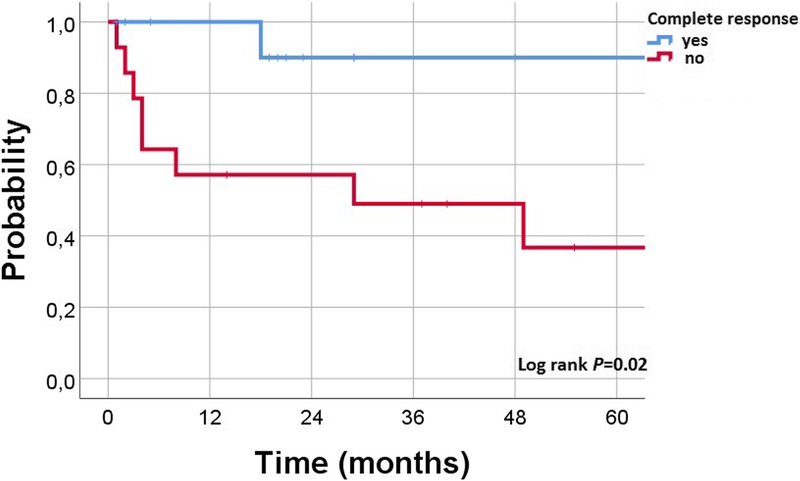 The hereby presented study reveals one of the largest study collectives of plasmocytomas in the literature and corroborates the role of RT as a curative treatment for EMP. A local control rate of 76% could be achieved which is in accordance with the literatur indicating a control rate between 66 - 100% [4, 6, 7, 9, 13, 20, 21, 22, 23]. Importantly, further sub-stratification revealed a significant favour of primary in comparison to secondary EMP regarding LC (93% vs. 61%), CR rate (67% vs. 22%) and 2-year OS rate of 85% vs. 53%. Although belonging to the continuum plasma-cell neoplasms altogether, primary and secondary EMP represent distinct entitities with different behaviour. Primary EMP is a localized disease and curable by local RT, while secondary EMP is a systemic disease. Various studies postulated cutoff-values between 40 and 49 Gy for improved control or disease-free survival [13, 24, 25, 26]. Other analyses often failed to demonstrate a dose-response-relationship or did not provide own insights in dosage [5, 6, 7, 27]. 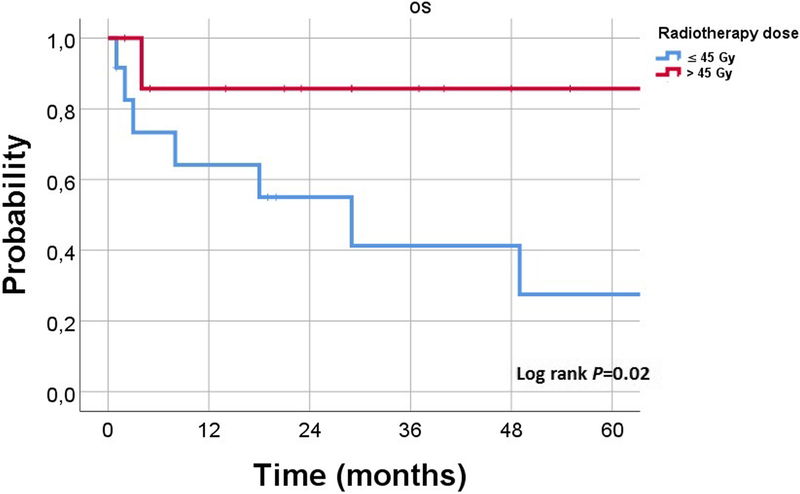 In a meta-analysis including 315 patients, a dose-escalation > 45 Gy showed improved disease-free survival . Strojan et al. introduced a differentiated approach demanding 40–50 Gy for macroscopic disease (with no local relapse with > 40), whereas adjuvant RT of 36–40 Gy may be adequate. Taken this data into account, the International Lymphoma Radiation Oncology Group (ILROG) has recently provided comprehensive guidelines on the treatment of MM and EMP recommending a dose between 40 and 50 Gy . One major drawback for dose-definition is the rarity of EMP requiring a patient recrutation of several decades with changes in radiation technique and concepts [21, 25]. Therefore, comparable patient groups concerning dosage could not always be established due to low patient number, biological different RT regimes (split course, hypofractionation) or limited dose ranges/variation [21, 24, 25]. The present analysis is one of the first to introduce a systematic comparison of nearly equivalent RT dose groups and elaborates the differences. A potential bias concerning RT location and subsequent dose adaption did not show a significant impact, probably due to small sample size .